MARINA DEL REY, CA--(Marketwire - March 10, 2011) - Spring into the life you've always wanted with luxury waterfront living in Marina del Rey. 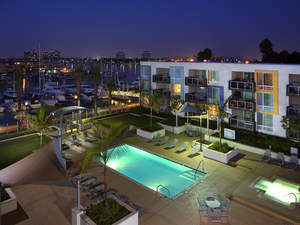 At www.TodayMarinadelRey.com, you can find your favorite Marina del Rey apartment, complete with gorgeous harbor views, endless activities and picturesque weather that encourage outdoor fun. Just minutes from Los Angeles, Santa Monica and Venice Beach, TodayMarinadeyRey.com offers a variety of Marina rentals for everyone's needs and wants, and with daylight savings arriving even earlier in March, you will have more time to enjoy scenic sunsets, jogs along the water and leisurely sails in the marina. Come early to tour Marina Harbor apartments on March 20 and enjoy a complimentary breakfast at the Villa Club Room, an occasion organized for all residents. Or, take pleasure in the outdoors and get moving with a tennis clinic on March 26 at Mariners Village, taught by tennis pro Buren Simmons -- always free for residents. Providing the complete waterside lifestyle for work and play, Esprit Marina del Rey offers amenities including complimentary beach cruisers, daily poolside Starbucks Coffee and morning newspapers, free WiFi, weekly yoga and Body Core classes as well as concierge service. With the many options the E&S Ring family of apartment rentals, everyday living is transformed into everyday luxury. The E&S family includes Bar Harbor Apartments, Esprit Marina del Rey, Mariners Village, The Tides and Waters Edge, and The Villa Apartments. A recreational Pacific coastal playground, Marina del Rey is a scenic retreat from city life while still centrally located near major corporate and office hubs, LAX and exceptional hotels, such as The Ritz-Carlton, Marina del Rey. With communities offering a range of leasing rates, it's easy to fine the perfect place to call home.